I’m pretty sure when I mention to people that I fly a small plane the first thing they think of is a small plane crashing. That’s when the little planes make the news, so that’s probably what is in their memory. Of course, I think about it pretty often, as well. The thought of crashing is overwhelmed by all of my memories of amazing trips across the country with the entire family on board, all the first flights friends and family have taken in the plane, all of the long, interesting flights I have flown on my own, and the very important flights with instructors. When my mind drifts to thoughts of our little plane three quick images parade past: the view past Nell as the wheels lift from the concrete and we rise over our little beach town and I can see from the ridges of the Santa Monica mountains to the curve of the Santa Monica bay; the perspective from my seat down past the wing to our airport and Venice as they slide beneath the leading edge and we head south over LAX; and the boys, usually lost in their own worlds already, looking either way out their own windows and listening to their podcasts or dubstep. But my personal approach to anxiety is to grapple with it rationally, to explore the risks, struggle to learn how they apply to me, and mitigate them as much as possible. So I do think about crashing, and what it would mean for our little plane and our little family. When I lived in Las Vegas and rode a motorcycle in the early 1990’s I talked to my brother about the risks. The statistics said that a motorcyclist crashed every ten thousand miles of riding. I was getting up around five thousand and did not relish setting the shiny blue bike down or skidding along the tarmac myself. I argued that since I didn’t drink, do any drugs, and had strict rules about when I allowed myself to get on the motorcycle and what sort of preparations I had to make when I did, that I shouldn’t be in the same pool of statistics. “That’s not the way it works,” my patient, scientific brother explained. But he looked at the statistics (which I believe I had sent in email, although it was a little prior to the world wide web), and he pointed out that a bunch of the reported incidents were at zero miles per hour. Rider pulls up to a stop sign, forgets to put his boot on the ground (or puts it on the wrong side, you’d be surprised), and the bike falls over. That counts. Since I had already set the bike down inadvertently twice (and once more in the following week), I’m now covered for thirty thousand miles. By the time I left Las Vegas I had nine thousand miles on my Seca II. It’s possible I have used up some of my luck, since Las Vegas had twenty-four hour drinking, retirees, newcomers, three shifts of people late to work, and a ton of construction vehicles hurrying to jobs. I didn’t get a day without seeing a high-energy collision, but I was never involved in one. One of the reasons that our plane is my favorite plane is that it mitigates two of the major risks associated with putting the plane down somewhere other than a runway or in a way that is less than ideal on a runway. Those two risks are bending and burning. Damage intrudes into the passenger compartment. Bending is simple. Planes are mostly made out of aluminum, since it is a very lightweight metal. When most of the current little planes were designed there were no computer models for stress analysis. Occasionally a plane was way over-built, but that made them expensive. The huge boom in general aviation was when four seater planes were about as expensive as a family station wagon. Like the station wagons of the early 1970’s, the engineering was about making the vehicle comfortable and useful when it was in motion. There was little or no thought about what would happen in an accident. This meant that a lot of people were killed in car accidents when they were impaled on the fixed steering column (thus the advent of the telescoping steering column instead and, eventually, the airbag). A lot of the planes from the 1970s are still flying. And even if you buy a brand new Cessna 172 for ten times what they used to cost when the design was originally drawn, it will be the same designed-for-flying-not-for-crashing. One of my favorite weather sites is run by a pilot whose father had to land a Piper after the engine went out. The resulting bent metal pinned the pilot’s leg in the plane and mangled it. Fortunately, he was able to be removed from the aircraft and taken to a hospital. Fire is often the result of bent metal, because the wings bend, rupturing the fuel tank, and a spark then sets it off. Thurman Munson would have survived (he had hit his head on the instrument panel) except that a fire had started and his friends couldn’t free him from the airplane before it got too hot to remain in the cockpit. One of the accidents out on Catalina, which happened after I started landing there, involved four friends in a Mooney. The pilot tried to climb away from the end of the runway too quickly and wound up mushing the plane down into a field after take off. According to the one fellow who survived they were all alive but one the one right next to the door was able to escape before flames consumed the plane. The worst one I have stuck in my head is a grandfather in his Cessna 172 taking his two grandkids for a flight. While he was on short final to land, a Bonanza (a larger, faster, low-wing plane) overtook him and (obviously not seeing him) landed on top of him as both planes crossed the threshold of the runway. 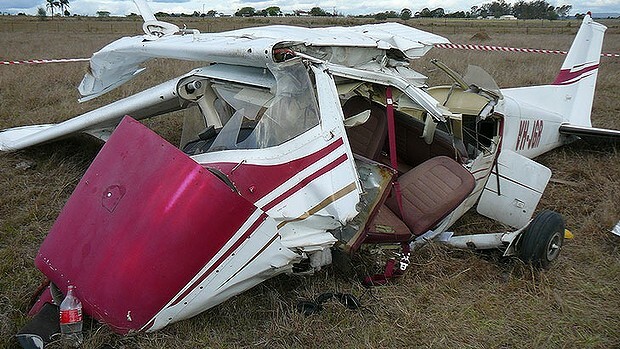 The pilot in the Bonanza survived. 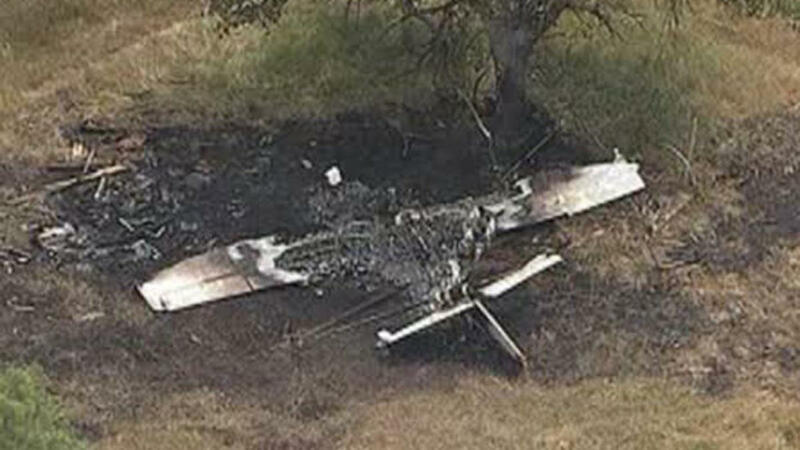 The Cessna was bent up and a fire started. They weren’t able to get any of the three out before the fire killed them. The Diamondstar is made of fiberglass and carbon fiber. Plastic, essentially, some of it strengthened with plain fabric and the rest strengthened with carbon fibers. There are two wing spars, each strong enough to carry the load of the wing in flight, set just forward and just aft of the fuel tanks in each wing. (This means that the fuel capacity of the plane is less than a plane like a Cirrus or Mooney, which both fill the wing itself with a rubber bladder and fuel. It’s called a “wet wing” and I would rather land a little more frequently for fuel than have something that could so easily spill a bunch of liquid explosive on the ground.) The Diamondstar is designed to keep the occupants safe in a crash, at the expense of the plane itself. The egg-shaped passenger compartment is a frame of carbon fiber and able to withstand a 27g impact without deforming (more force than a human body can withstand). The landing gear, engine mount, wings and tail section are all designed to break away in an accident, which absorbs some of the energy of the impact. This is similar to the crumple zones that Mercedes Benz added to the cars in 1954 (although not popular until the early 1980s when the proved how useful they were in computer simulations). And it works. I wrote before about the fellow that made a wrong turn down a canyon and had to fly the plane into the side of the canyon. All four occupants walked away. I’m okay with this end result. 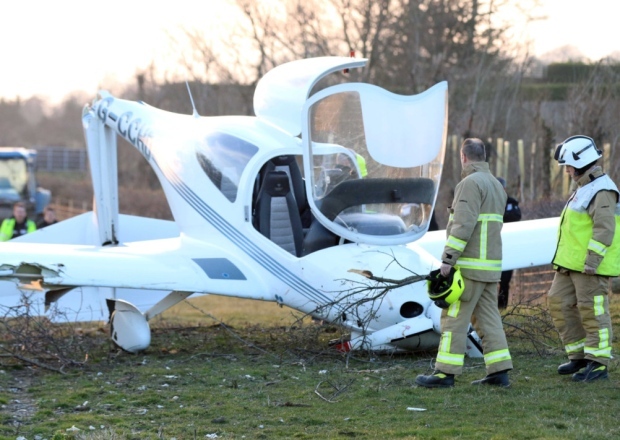 The pilot said the engine started misfiring and then stopped, so he had to make an emergency landing. He eventually hit a fence and did a somersault. Mr Griffiths said he saw the pilot emerge from the smoke completely unharmed. I’m not sure where the smoke would have come from (sure doesn’t look like there was a post-crash fire), but a pilot walking away is a great thing. Results of a great pilot at work. Harrison Ford and I share the same airport. He’s got a few more airplanes than I do. More importantly, he’s a much better pilot than I am. He’s an amazing pilot. A PT-22 is a fighter trainer that was built in 1933. If the engine were to stop on my plane (which happened to the fellow in England on this very page), I would be able to glide a mile for every thousand feet of altitude I had. That’s a lot of area to select your landing spot. When you lose the engine on a PT-22 you might as well be flying a Coke machine. Look straight down, because that’s probably where you’ll need to land. According to the audio tape from the tower, Ford tried to turn and return to the airport. That turn (engine failure on takeoff, one hundred eighty degree return to land on the same runway you just left) is known as The Impossible Turn. 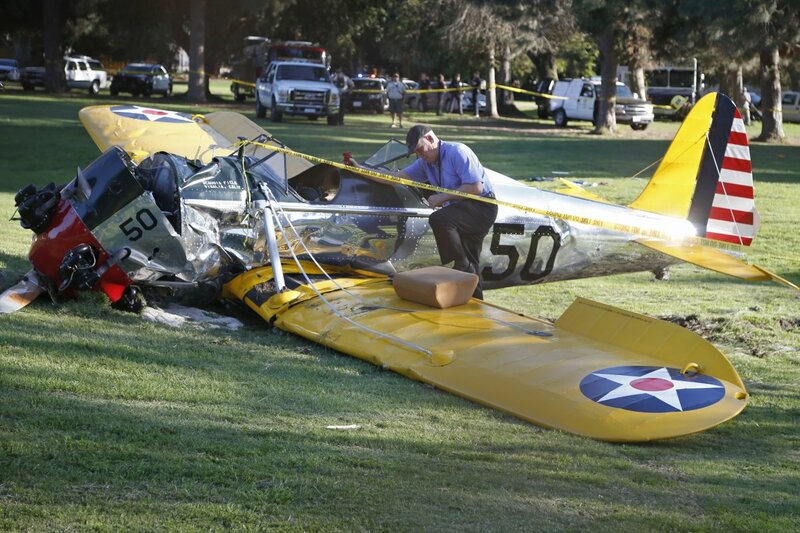 Pilots know not to do it unless they have enough altitude and I trust Ford knew his plane and altitude well enough to make the call. (The other option was probably putting it down on the sand or into the water.) The NTSB preliminary report says that he clipped a tall tree adjacent to the golf course and had to put it down on the fairway instead. He was smart. By using a golf course for his forced landing he had two doctors offering assistance before the plane had even slid to a stop. They got him out and he was resting nearby when the paramedics arrived. He fractured his ankle and pelvis, which I think he had injured on the Star Wars set recently, so maybe it was just a re-fracturing of an existing injury. The best piece on the subject was written for Flying Magazine. I really enjoy reading your posts – your thoughtfulness and historical perspective really enlighten me and encourage me as I consider finally taking the step and training for my license. And I have been obsessed with the Diamondstar since I first saw it! Thanks, Mark. If you have specific questions feel free to post them as comments or send them in email. colin at mightycheese dot com.